First things first it's almost time for SUMMER CAMPS! We have three learning to sew camps for Kids at Bernina of Oklahoma City. In this class kids will learn the parts of the machine and how to sew safely. Other skills will include changing needles, winding bobbins, and more. The will make a wind sock and a patchwork pillow with a zipper on the back! This is the second class in our Kids Camps. In this class the students will learn how to read a sewing pattern, pick the proper size, cut out and make their own PJ pants. This is a great class and the kids always have a good time. Students need to have take bobbin winders or have permission to take the class as we will start cutting out and sewing on the first day. This is a great class for kids who want to quilt like mom or grandma! They will make a simple quilt and learn about 1/4 seams, quilting, and finishing. Kids will need to have taken Bobbin Winders or have some experience with a sewing machine. Depending on demand, and what the kids want to do, they can either make a shirt with buttons OR make a simple quilt! This is for kids who have a better attention span and can handle their pears working on a project different from their own. ALSO: if a group of friends wants to sign up together, they can work on a project of their choice. Just take all four seats! All classes include a lunch break, kids are encouraged to bring their lunch and keep it in the fridge. Parents can also take their children to close restaurants, but they need to be back on time to ensure that they finish their projects. This great new software is for people who just want to do lettering, or monogramming, or editing, or all three! 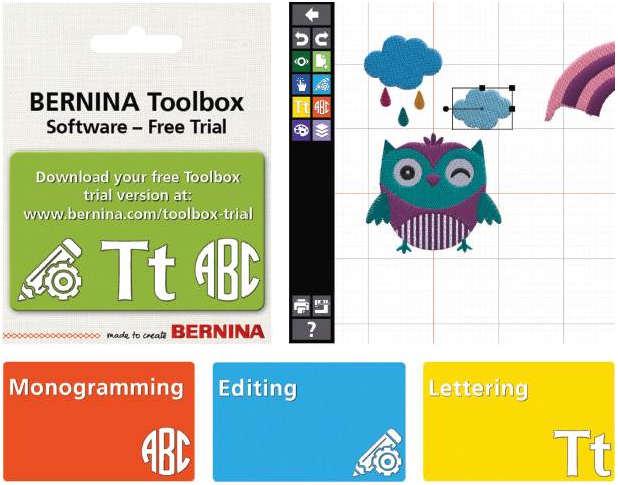 This program will use the BERNINA CLOUD so it will be usable on PC or Mac! *not currently iOS iPhone or iPad, but your iMac or MacBook yes. Come and learn what the excitement is about with us on May 30th, Tuesday at 6:00pm. We are going to watch the Live Webinar from Bernina and learn about it with you.